In 2016, the Philadelphia Tenants Union (PTU) announced at its founding convention that the Union was committed to making “Good Cause” eviction protections one of its primary objectives (the other being tenant support at particular apartment buildings). With this commitment, PTU members began organizing support in communities, and eventually in City Council, to get a Good Cause bill introduced. The Philadelphia City Council eventually introduced the bill in October 2017. Bill 170854, which amends the “Unfair Rental Practices” city code, proposed protections for tenants that require landlords to renew a lease for any tenant unless they break some aspect of their lease. Examples of this might be: habitually not paying the rent, refusing the landlord entry of the property to do regular repairs, damaging the property, or rejecting a proposed rent increase. The bill seeks to hold landlords accountable and protect tenants from wrongful and arbitrary evictions. After the bill was initially introduced in 2017 by council member Curtis Jones, Jr. along with council members Helen Gym and Cherelle Parker, the bill passed committee in February 2018 and moved on to the full City Council. It stalled there, in large part because of pushback from lobbyists representing the property managers and landlords, such as HAPCO. The final amendments to the bill were introduced on November 29. After that, the PTU and its partnering organizations only had one week to lobby the remaining council members for their support before the final vote. Over that week, the Tenants Union pushed hard to get out the information that 7 of the 16 City Council members had confirmed their support of the Good Cause bill. That meant the bill needed two more votes to pass. 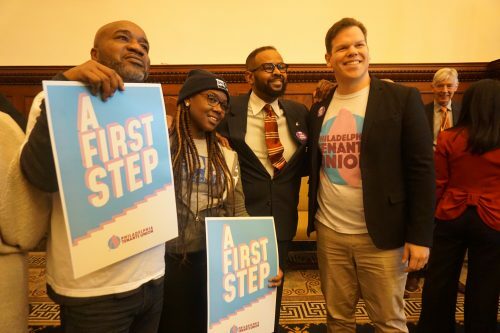 On December 6, Philadelphia City Council unanimously passed the bill. However, the bill only passed after a series of concessions were made to City Council and the real-estate lobby. “Yesterday’s vote is an important milestone in protecting renters in our city. However, several politicians succeeded in watering down elements of this bill to curry support from landlords and developers,” the PTU stated in a post on Facebook. This “watering down” refers to the compromise that the PTU organizers had to make, proposing an “amendment to the bill that would limit Good Cause provisions to month-to-month leases,” Jarrett Smith (the Good Cause campaign director) explained.